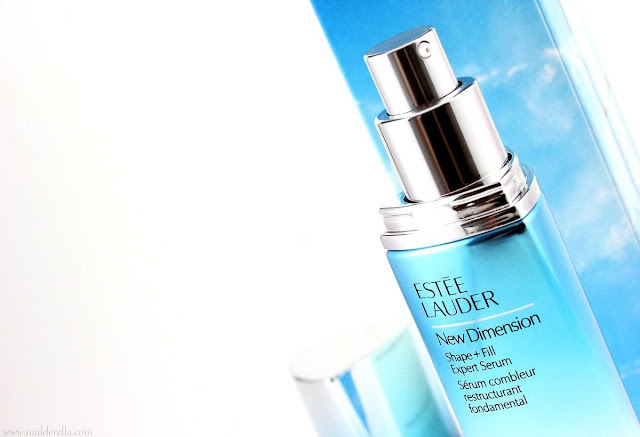 I have a review of Estée Lauder serum from their newest line called New Dimension. I've already shown here on the blog a preview of this serum as well as other products from this line some time ago and you can read it HERE if you missed it. 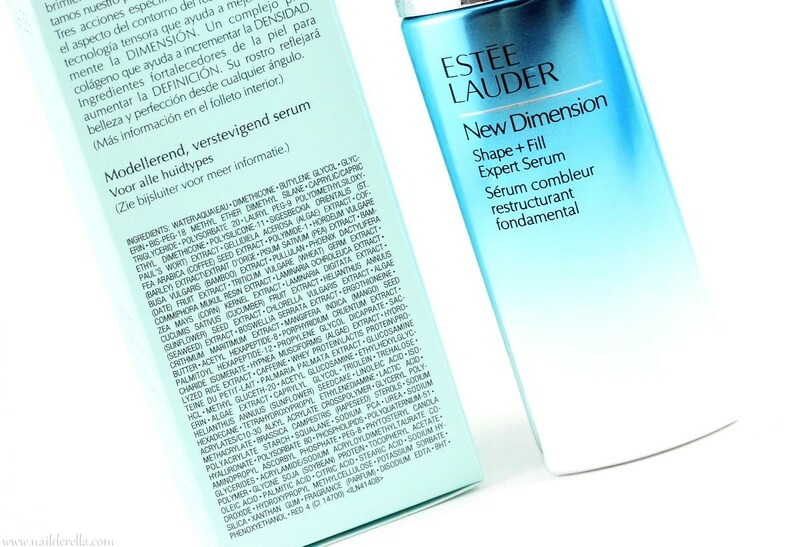 I've just finished using the "New Dimension Shape + Fill Expert Serum" and really enjoyed using it and that's why I've decided to review it in more details. 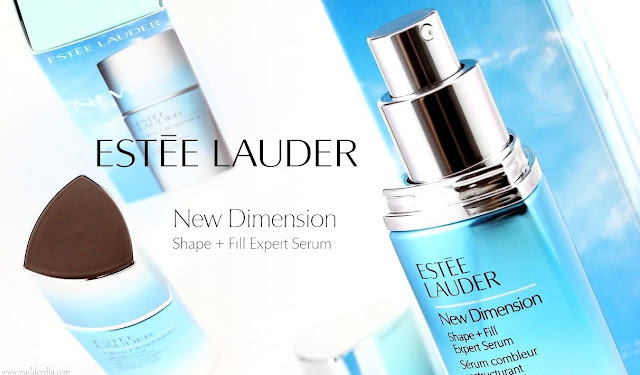 Estée Lauder New Dimension Shape + Fill Expert Serum helps to get more defined facial contours. It is an anti-aging serum packed with antioxidants and skin repairing ingredients. By the way, when I say "anti-aging" it doesn't mean this product is only for mature skin of course. It rather means that it will protect your skin from environmental damages, condition and repair your skin. Therefore even younger skin will benefit from such a serum, and it is indeed better to start caring for your skin as early as possible. "Now, look more beautiful from every angle. 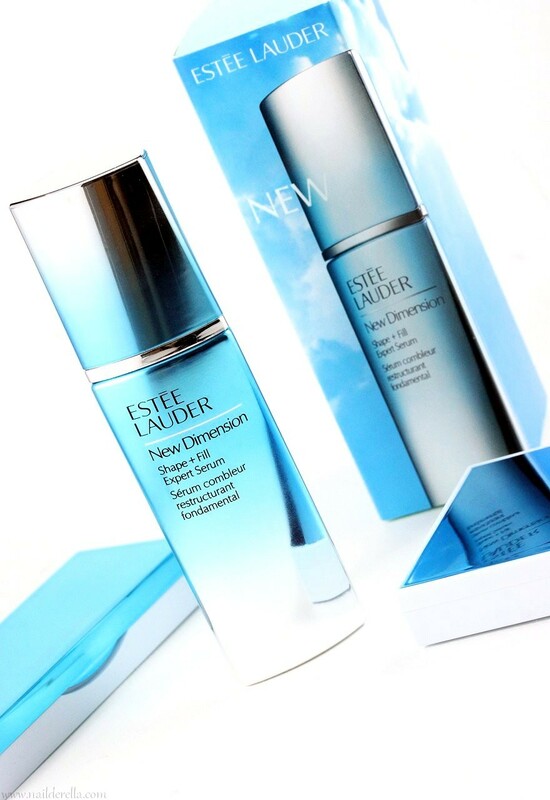 With this innovative serum, in just 2 weeks you’ll see more defined looking facial contours. Cheeks and jawline appear more lifted. It’s that effective. Look in the mirror. 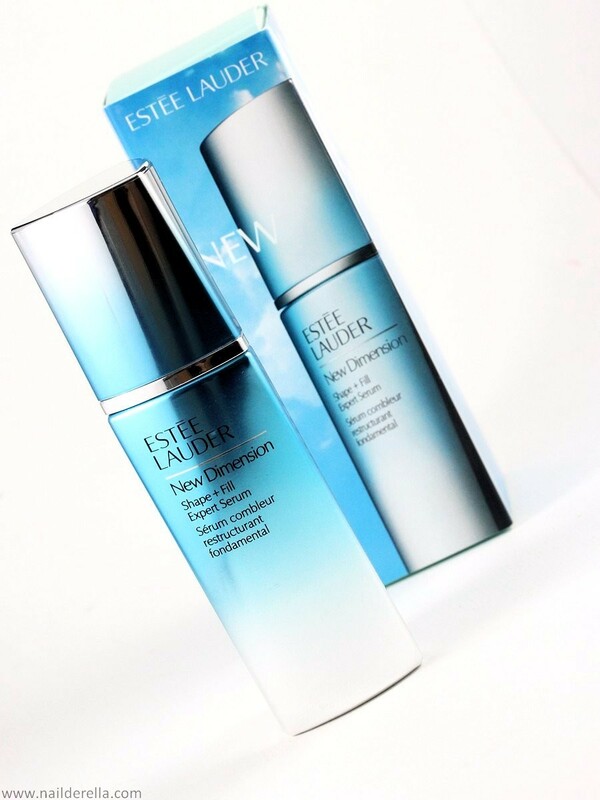 You’ll love what you see with New Dimension—skin that looks radiant and more defined." The serum comes in an opaque bottle with a pump for a convenient product delievery. The serum contains many antioxidants and this type of packaging is the best to preserve the activity of these useful ingredients. 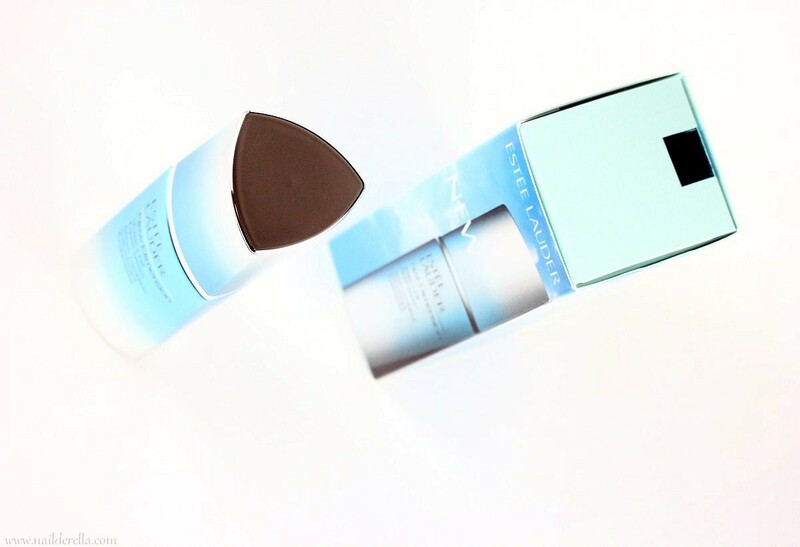 It is a silky and milky serum that spreads easily on skin. It's lightly moisturizing. It has a hint of flower scent, I can't tell what scent exactly but it's quite a lovely and rather subtle smell. It contains mainly emollients, skin repairing and antioxidant ingredients, as well as some anti-inflammatory molecules (as part of botanical extracts). It also contain different types of algae extracts and 2 anti-wrinkles peptides. All of them will help improve skin and help repair the signs of aging. I did a litterature research on algae and peptide in skincare and will summary quickly what I learnt. Without entering too much into details, many algae contain antioxidant molecules that have a promising potential in skincare and in food supplements. As usual, antioxidants are really useful to protect cells from oxidative stress responsible of many diseases and aging. Algae also contain polysaccharides. Polysaccharides are responsible for the skin’s natural ability to hydrate and retain water. They are critical for skin repair and skin renewal. If you want to know more about algae and their potential, you can read the following review articles (1, 2, 3). Acetyl hexapeptide-8 (Argireline) used in this serum showed good results in a study on 10 healthy volunteers when used as an emulsion formulated at 10% of peptide. Results show significantly more reduction in the depth of wrinkles for Argireline group compared to placebo (4, 5, 6). The second peptide used in this serum is Palmitoyl Hexapeptide-12 (Pal-KTTKS ). It is supposed to stimulates collagen I, III and VI, fibronectin,elastin and glucosamnoglycans production. In a study on 93 Caucasian female volunteers, Pal-KTTKS had significantly better scores than placebo for expert grader assessment and subject self-assessment of age hyperpigmented spots. Another study showed a robust result for this peptide in reducing bumpy texture and fine wrinkles compared with other baseline and comparators. This study was made on 180 volunteers (6). As you can see for the 2 peptides of this serum, there are well designed studies that demonstrate their interesting properties in terms of anti-aging. The only thing is that in these studies peptides were forumlated at higher concentrations that here. Nevertheless, they still remain interesting ingredients. Water, Dimethicone (humectzant), Glycerin (humectant), Bis-PEG-18 Methyl Ether Dimethyl Silane (slip agent/emollient), Caprylic/Capric Triglyceride (emollient/skin repairing), Polysorbate 20 (surfactant), Lauryl PEG-9 Polydimethylsiloxyethyl Dimethicone (thickener/emulsifier), Polysilicone-11 (film-former), Sigesbeckia Orientalis (St. Paul's Wort) Extract (anti-inflammatory), Gellidiela Acerosa (Algae) Extract (antioxidant/thickener), Coffea Arabica (Arabian Coffee) Seed Extract (antioxidant), Polyimide-1, Hordeum Vulgare (Barley) Extract/Extrait D’Orge (antioxidant), Pisum Sativum (Pea) Extract (antioxidant), Bambusa Vulgaris (Bamboo) Extract (antioxidant/anti-inflammatory), Pullulan, Phoenix Dactylifera (Date) Fruit Extract (antioxidant), Triticum Vulgare (Wheat) Germ Extract (antioxidant), Commiphora Mukul Resin Extract (anti-inflammatory/antisepetic/antioxidant), Laminaria Ochroleuca Extract (alga, anti-inflammatory), Zea Mays (Corn) Kernel Extract (emollient), Laminaria Digitata Extract (alga, antioxidant), Cucumis Sativus (Cucumber) Fruit Extract (antioxidant), Helianthus Annuus (Sunflower) Seed Extract (emollient), Chlorella Vulgaris Extract, Algae (Seaweed) Extract (anti-inflammatory), Boswellia Serrata Extract (anti-inflammatory but fragrant plant), Ergothioneine (antioxidant), Crithmum Maritimum Extract (antioxidant), Mangifera Indica (Mango) Seed Butter (emollient/skin repairing), Acetyl Hexapeptide-8 (antiwrinkle peptide), Porphyridium Cruentum Extract (alga containing polysaccharides and fatty acids, UV protection), Palmitoyl Hexapeptide-12 (anti-wrinkle peptide), Propylene Glycol Dicaprate (skin conditioning agent), Saccharide Isomerate (water-binding, emollient), Hypnea Musciformis (Algae) Extract (antioxidant), Hydrolyzed Rice Extract (skin conditioning agent), Caffeine (antioxidant), Whey Protein (skin conditioning agent), Palmaria Palmata (Dulse) Extract (algae, antioxidant), Glucosamine HCL (skin repairing), Methyl Gluceth-20 (humectant), Acetyl Glucosamine (skin repairing), Ethylhexylglycerin (preservative), Algae Extract, Caprylyl Glycol, Triolein, Trehalose, Helianthus Annuus (Sunflower) Seedcake, Linoleic Acid, Isohexadecane, Tetrahydroxypropyl Ethylenediamine, Lactic Acid, Acrylates/C10-30 Alkyl Acrylate Crosspolymer, Glyceryl Polymethacrylate, Brassica Campestris (Rapeseed) Sterols, Sodium Polyacrylate Starch, Squalane, Sodium PCA, Urea, Sodium Hyaluronate, Polysorbate-80, Phospholipids, Polyquaternium-51, Aminopropyl Ascorbyl Phosphate, PEG-8, Phytosteryl Canola Glycerides, Acrylamide/Sodium Acryloyldimethyltaurate Copolymer, Glycine Soja (Soybean) Protein, Tocopheryl Acetate, Oleic Acid, Palmitic Acid, Citric Acid, Stearic Acid , Sodium Hydroxide, Hydroxypropyl Methylcellulose, Potassium Sorbate, Silica, Xanthan Gum, Parfum/Fragrance, Disodium EDTA, BHT, Phenoxyethanol, Red 4. As I said at the beginning of this article, I've just finished my bottle of New Dimension serum and really enjoyed it for several reasons. First, the texture and scent of the serum are really nice and therefore it's a pleasure to use. 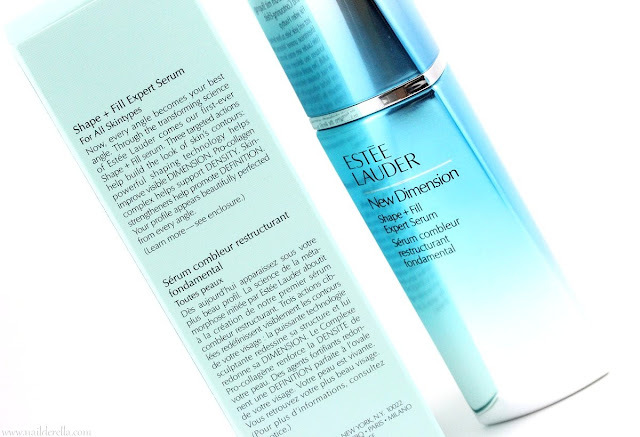 The serum is rather lightweight and can be use by all skin types. 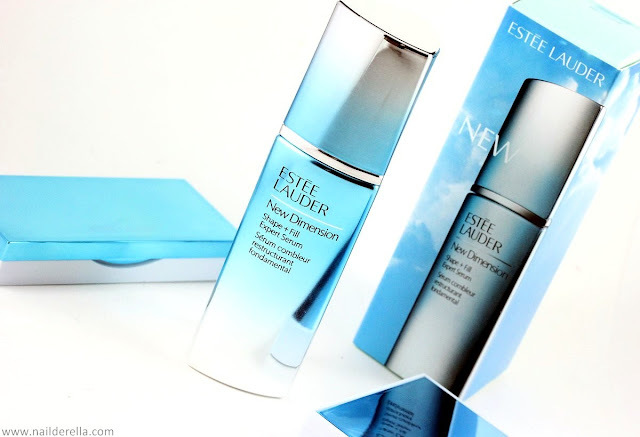 Second, despite the unrealistic claims that this serum will help improve volume and structure of your face, it is well formulated and is a very good anti-aging serum. It contains different botanical extracts, such as St Paul's Wort, Coffee, Barley, Pea, Bamboo, Date, Cucumber extracts, Mango butter, etc. It's packed with antioxidants (i.e., protect your skin against oxidative stress) and anti-inflammatory ingredients. Moreover, it contains 7 different types of algae. Algae extracts have antioxidant properties and can also help repair and renew the skin. Finally it contains 2 interesting peptides with anti-wrinkle activities. For all these reasons, I consider Estée Lauder New Dimension serum as a pretty solid anti-aging serum that will help improve skin and help repair the signs of aging. Concerning my experience with the serum, I didn't notice big differences because my skin isn't too bad to start with but it managed to keep the red patches I tend to have on one of my cheeks at bay (probably thanks to the antioxidant and anti-inflammatory extracts), and this is already a very good point. I also noticed that my skin was a little bit more radiant and clearer. This is definitely the type of serums you should always have in your routine to protect your skin, strengthen it and help fight the signs of aging. So yes, in summary, that's the serum I would gladly repurchase. 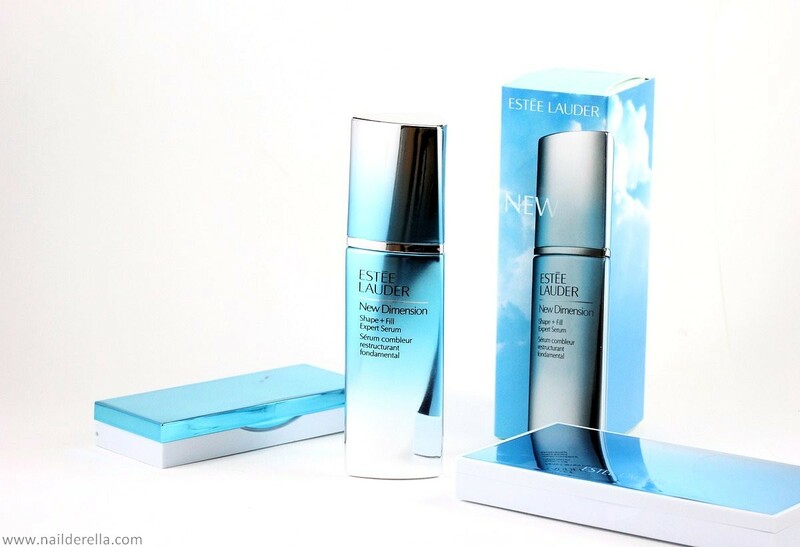 Estée Lauder products can be purchased from autorized retailers (Nordstrom, Selfridges, Marionnaud, Douglas, Manor, Globus). For Switzerland, you can find a list of them here.